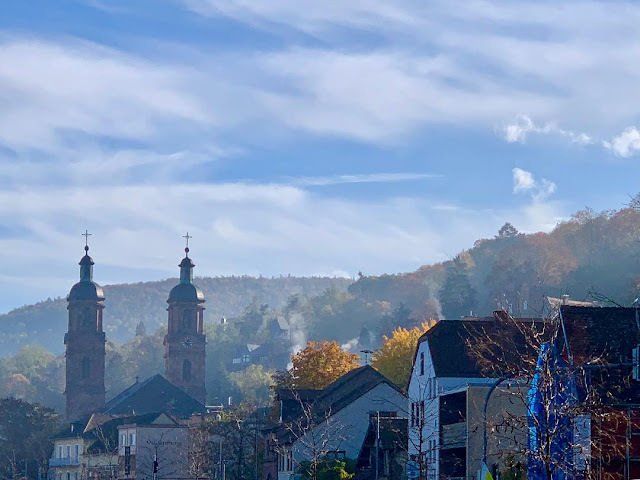 When we woke on the day we were headed to Miltenberg, Germany, the river was shrouded in fog. Thick and cold, leaving the railings of our Juliet balcony covered in glistening water droplets. Ed had a hike planned with one of the groups so he was hoping the fog would lift and give way to scenes ripe for photos. I don't think a wet forest hike was very appealing. I was thinking about doing the old town walking tour but as I got ready for breakfast, was still undecided. In the meantime, the ship sidled up to the left side of the Main River and docked. Looking out from the back deck we could see the fog lifting as the sun peeked over the Odenwald Mountains. I decided to go for the tour. The town was pretty amazing - lots of very old half-timbered homes, cobblestone streets, a butcher, baker, and probably candlestick maker if I looked hard enough. Very charming. Tomorrow we're off to the Rhine Gorge! *Morgen is the German word for morning.